For those who are becoming more conscious of the foods they eat, look for healthy alternatives to foods that are nutritionally inadequate. 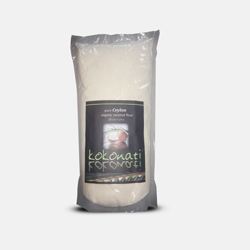 When seeking a healthy flour alternative, coconut flour meets the requirements. 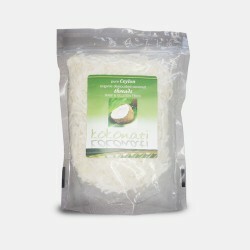 Made from the meat of coconuts after the oil has been removed, coconut flour is loaded with nutrients that offer numerous health benefits. Gluten is a protein molecule found in certain grains, such as wheat, barley and rye. Gluten is highly allergenic, and even potentially deadly to those who have celiac disease, which is a condition where the gluten destroys the intestinal celia. However, even if you don’t have celiac disease, you can still be negatively affected by the gluten protein. The National Institutes of Health report that exposure to gluten, especially wheat flour, can cause an inflammatory response in the body, even in healthy individuals. Simply breathing in flour dust is found to cause inflammation of the lungs. Inflammation in the body can cause arthritis and even organ damage. This is why coconut flour is so beneficial. It is gluten free, and does not trigger an inflammatory response within the body. It can be used in baking and cooking your favourite desserts and sauces. Coconut flour contains almost double the amount of fibre found in wheat bran. Fibre has numerous Health benefits, from reducing the absorption of sugar into the blood stream, to lowering cholesterol. In fact, according to a study published in the December 2006 issue of “Innovative Food Science & Emerging Technologies,” adding coconut flour to your food intake can significantly reduce your cholesterol levels. It can also reduce your risk of developing heart disease, diabetes and certain types of cancer. Naturopathic Doctor, Bruce Fife, explains that the recommended fibre intake is between 20 to 35 g per day, with very few people even coming close to that amount. 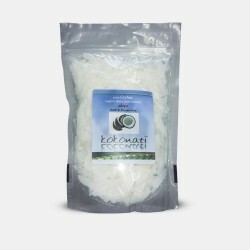 He suggests that you add coconut to your daily routine in the amount of a few tablespoons per day. Adding it to your gravies, casseroles, baked goods, or even a dab to a smoothie will significantly raise your fibre intake. Although coconut flour does not contain the gluten protein, it still has significant protein content. 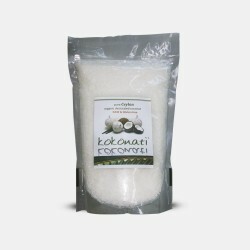 A report from the Coconut Research Center states that coconut flour contains more protein per serving than the other leading flours, such as white, rye or cornmeal. It contains just as much protein as wheat flour, even though it doesn’t contain the gluten protein. Coconut Flour can be used to make breads, cakes, pies and other baked goods. It can be replaced 3550% in place of other flours in most standard recipes. It can also be used as a thickener for sauces, curries and soups. 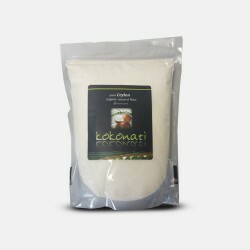 KOKONATI Organic Coconut Flour is gluten-free and hypoallergenic and ideal for those following a low carb eating plan. It has fewer digestible (net) carbs than any other flour including Soy! It even has fewer digestible carbs than most vegetables! Its high fibre content helps provide a feeling of satiety.